I am not a Harry Potter fan, and I say that having never read the books or watched the movies, but the story of a boy wizard and magic spells have never interested me. That is, until I saw PUFFS or Seven Increasingly Eventful Years at a Certain School of Magic and Magic. Set during Harry and friends' time at said school of magic, PUFFS focuses on another student who was around at the time of Harry's reign, Wayne, and his friends who had been assigned house Puff, the house that no one really wants to be assigned. 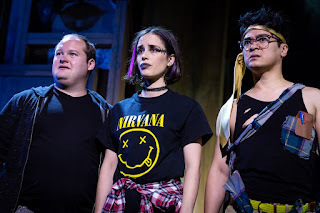 Written by Matt Cox, PUFFS is littered of Harry Potter references and in-jokes, and while some of them went over my head, if you are at all familiar with the tropes of such stories, then you will still find yourself laughing along. Cox isn't just making cardboard cutouts of fantasy stories in his play, but creating fully fleshed out characters with motivations and desires that you find yourself supporting wholeheartedly. This is done so carefully and considered, that you don't realise how emotionally attached you are to the characters until the final genuinely suspenseful scenes. Of course, credit must also go the highly talented cast, who are absolutely wonderful on stage. Keith Brockett, Eva Seymour and Ryan Hakwe (Oliver, Megan and Wayne) share amazing chemistry between them as three friends navigating their way through school, with all the typical (and not so typical) trials and tribulations of being a teenager included, such as absent parents and first kisses. 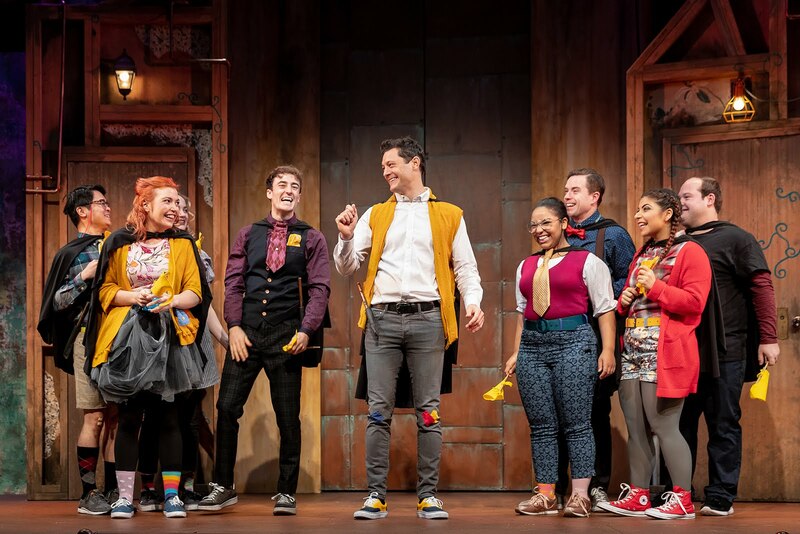 Rob Mills is perfectly cast as the charming Cedric, who inspires the Puffs to believe in themselves. The rest of the ensemble - Olivia Charalambous, Tammy Weller and Matt Whitty, Annabelle Tudor, Zenya Carmellotti and Daniel Cosgrove - take on numerous roles throughout the show, and they never disappoint in their portrayals. Each one is established as being a complex person with feelings who come with a history, even when they are only on stage for a few minutes. Gareth Isaac as the narrator keeps the story on track and provides a humorous but clear introduction and overview to each year of the story that also allows for non-Potter fans to keep up. Director Kristin McCarthy Parker uses the space in the Alex Theatre to full effect, ensuring that there's plenty of room to allow the actors to freely move, especially during the climatic battle scenes. Under Parker's direction, all the characters and actors are given a reason to be on stage, which isn't always the easiest thing when you have a cast of eleven. Initially, Madeleine Bundy's stage design appears quite simple but the way it is manipulated allows for many surprises to be experienced along the way. Her costumes and props are strokes of genius particularly in bringing the various monsters to life. The lighting design by Herrick Goldman, based on the NY production, is used effectively to heighten the emotional states of the characters and the tone of the scenes. PUFFS is an uplifting reminder that while everyone always has their eye on being the next Harry Potter (or Hermione or Ron), it can be just as great and rewarding to be the next Wayne (or Megan or Oliver). A delightful show for both Harry Potter fans and non-fans, it is impossible to walk out of PUFFS without a big smile on your face.